ENTERPRISING Zimbabwean youths, who have previously been restricted to unprofitable backyard businesses due to lack of funding, are set for a new dawn where they contribute significantly to economic turnaround following the establishment of EmpowerBank to support their endeavours. EmpowerBank, which was officially launched by President Mnangagwa last Thursday, is a deposit taking, youth focused, low-interest rate charging microfinance institution. Critically, it will lend on the basis of collateral in the form of movable property, since its target market is the unemployed who do not possess assets. Its loan book thrust is 70 percent youth enterprise support and 30 percent for the general public. The bank is expected to lend funds to “good business ideas”. EmpowerBank is capitalised to the tune of US$12,5 million. Youth, Sport, Arts and Recreation Minister Kazembe Kazembe told The Sunday Mail Business last week that the bank will transform the lives of youths across the country. “We have some of the most educated youths on the continent but they have no meaningful businesses to talk about since they cannot access loans from commercial banks as they do not have collateral,” said Minister Kazembe. “But the setting up of this bank will ensure that all youths with sound, solid, bankable and clear ideas, get funding. EmpowerBank has been set up to underline Government’s endeavours to ensure that appropriate and sufficient measures are undertaken to create employment and economic empowerment opportunities for youths and other marginalised people and communities, in sync with Sections 14 and 20 of the Constitution. “In the next five years, our priority areas of focus will be peace . . . creation of jobs; mainstreaming of youth and women in all economic sectors . . .” reads part of the Zanu-PF manifesto. President Mnangagwa said EmpowerBank is another building brick that has been laid towards creating a more prosperous future for the young people of our great country. Youths have previously dishonoured their obligations to repay loans, particularly those obtained under the Youth Development Fund. More than 85 percent of youths who accessed loans under the US$10 million revolving Youth Fund failed to pay back. Each province was allocated US$1 million and Masvingo province, for instance, only repaid US$44 707 out of the US$230 310. Considering there is no movable collateral required for youths and other marginalised groups of people to access loans from EmpowerBank, market watchers fear some will default again. But Minister Kazembe said to ensure beneficiaries pay back, they are working on foolproof modalities with the RBZ. “There is an arrangement we are working on with the RBZ where youths will get assistance for any bankable projects,” said Minister Kazembe. Order financing, a short-term commercial finance option that avails capital to pay suppliers upfront for confirmed purchase orders, will also be considered when approving youth loan applications. 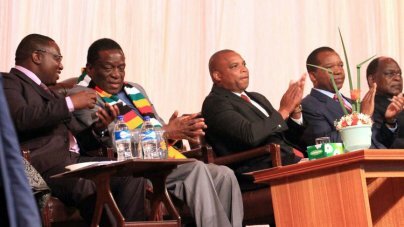 President Mnangagwa also exhorted the youths and other beneficiaries of the bank packages to be “honest, straightforward and responsible and pay back the loans advanced to them”. The President said gone are the days when people would access money and not pay back. In its National Financial Inclusion Strategy agenda, the RBZ has created a credit registry, which provides for robust credit information sharing. The credit registry is already functional. Further, the RBZ is working towards the establishment of a collateral registry that enables disadvantaged groups to pledge movable property as collateral to access funding from financial institutions. The credit guarantee scheme was also re-established and is being re-capitalised to facilitate productive lending to the marginalised groups with inadequate collateral. The launch of EmpowerBank, just over a week after the Zimbabwe Women’s Microfinance Bank, has reignited questions on whether or not Zimbabwe is overbanked. Already, there are 27 financial institutions made up of 13 commercial banks, five building societies, one savings bank, six deposit taking microfinance banks and two development financial institutions (SMEDCO and IDBZ). RBZ Governor Dr Mangudya last week said “there is nothing called overbanked”. “We are talking about the services that banks are offering. The banks in this economy as you know, they don’t want to provide loans to some groups of people, which means that there is a gap that needs to be filled by this bank (EmpowerBank). He added that it would be reckless to ignore a group of people that makes up 35 percent of the population. Dr Mangudya said youths have good (business) plans, which must be financed.